Timothy Leland Crosthwait was born on 5 August 1915, the son of Katherine Rosa Man and Leland George Crosthwait. He married Anne Marjorie Penny on 30 May 1959. She was born on 8 September 1924 in Callendar, Perthshire, Scotland. Timothy died on 9 November 2006 in London. Timothy and Ann belong to Generation Seven. There was no issue. Anne Marjorie Crosthwait (nee Penney) died in London on 14 October 2012. 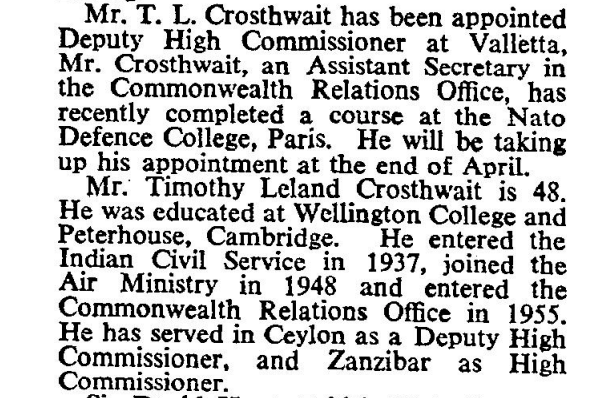 Timothy Crosthwait: Diplomat who was High Commissioner to Zanzibar during the bloody revolution. Timothy Crosthwait, CMG, MBE, diplomat, was born on August 5, 1921 [sic]. He died on November 9, 2006, aged 85. 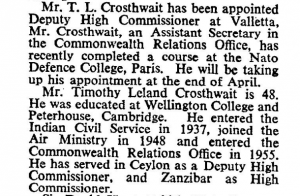 Timothy Crosthwait’s diplomatic life was spent largely in unstable Third World tropical countries, but the posting which highlighted his career was High Commissioner to Zanzibar. With no previous experience of the region, he had a rough introduction to Africa when he took up his post on December 10, 1963. That was the day after the island’s independence ceremony, which was attended by the Duke of Edinburgh, Duncan Sandys, the Commonwealth Secretary, and a Royal Marines band. Less than a month later a bloody revolution overthrew the Government, drove the Sultan into exile in Britain and led to the massacre of thousands of Arabs and Asians. In the aftermath, many people asked why Britain had gone to so much ostentatious fanfare only to leave the new nation vulnerable to its enemies. The main fault, however, lay with the effete Sultan and his Arab-dominated Government, which looked down on Zanzibar’s black African population and underestimated their grievances and unrest. As the height of its folly, the new Government abjured any security treaty with Britain, pensioned off most of the British police officers and dismissed many mainland African police officials and NCOs. Neither the British High Commission, the Americans nor the Zanzibar security service had any idea of plans by a Ugandan calling himself Field Marshal Okello and a ragtag group of followers armed with spears and bows and arrows to seize power and slaughter the Arab and Indian population. Late one night they stormed the local police station seizing weapons, occupied the radio station and quickly disposed of the rest of the police force. Zanzibar had no army. The first the population heard of the revolution was a broadcast stating: “I am the field marshal. Wake up you imperialists. There is no longer an imperialist governor on this island”. The US Consul, witnessing the beginnings of the massacre, urged Crosthwait to bring in British forces to put down the uprising. A British warship was nearby in the Indian Ocean. Muhammad Shamte Hamadi, the Zanzibari Prime Minister, requested the High Commission to bring in British troops and warplanes from Kenya. Hamadi’s request for military intervention was received by the Commonwealth and Colonial Office in London, but was rejected because Zanzibar had no military agreement with Britain. Washington was then informed that because the British High Commissioner had reported no immediate threat to British nationals or property, the Government had decided there was no need for an evacuation. British residents, however, were angry that Crosthwait did not make a stronger case for intervention, which would have saved the lives of an estimated 5,000 Arabs and Asians. However, Don Petterson, an American consular official, said that Crosthwait had done a “creditable job” during the early chaotic days of the revolution and had comported himself “with courage and dignity” while handling the eventual evacuation of British residents. Britain and America were reluctant to recognise the revolutionary Government, which angered the new President, Abeid Karume, who gave Crosthwait and his staff 24 hours to leave the island. Crosthwait was allowed back a month later, after the UK and US recognised the new Government. On the day that he presented his credentials, however, Karume ordered him to leave the country again. He had, at the insistence of Sandys, criticised Okello for referring to the British as “devils” during a press conference. Luckily Sandys visited Zanzibar and persuaded Karume to rescind the order. The incident further damaged Crosthwait’s effectiveness but he was transferred soon afterwards when Tanganyika and Zanzibar merged into Tanzania and the High Commission was downgraded to a consulate. 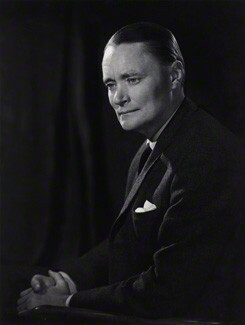 Crosthwaite was appointed CMG in 1964. Only a week after the Zanzibar revolution the army in Tanganyika mutinied. With the example of Zanzibar in mind, British forces were sent in immediately to restore order. Timothy Leland Crosthwaite joined the Indian Civil Service in 1937 and served as assistant private secretary to the Viceroy of India from 1942 to 1944. He was appointed MBE in 1944. In 1955 he joined the Commonwealth Relations Office and spent four years as Deputy High Commissioner in Ceylon. After Zanzibar he became Deputy High Commissioner in Malta then High Commissioner in Guyana. He was Ambassador to the Malagasy Republic, 1970-75. He is a survived by his wife, Anne, whom he married in 1959.